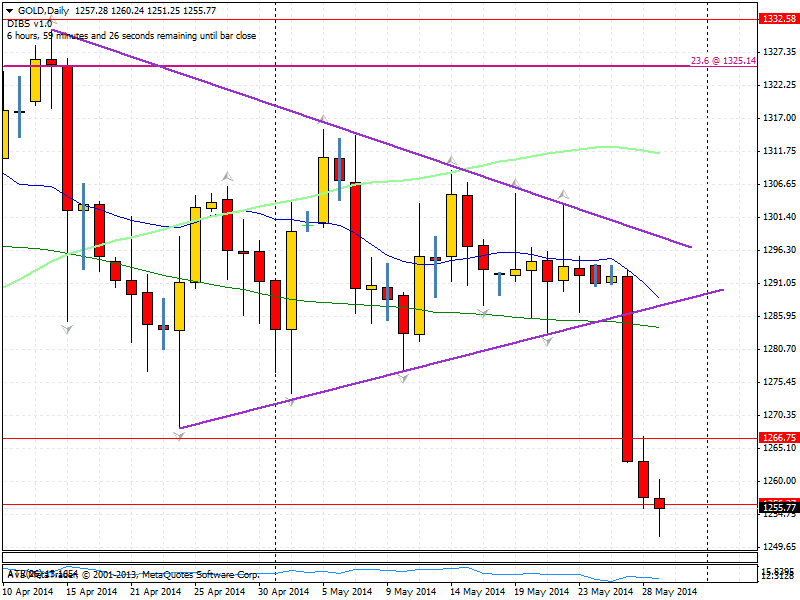 29/5/2014 – The Gold triangle bursts! I maybe on my holidays in the highlands of Scotland but I had a chance to look at the odd chart. Earlier this week I drew attention to the gold price coiling up into a tight triangle pattern (click this hyperlink to read that piece). I hadn’t expected it to explode so soon but I see that it did that a couple of days back. Take a look at the chart below. Its broken strongly south this week and headed back down towards the $1250 area. Keep an eye on it in case it continues down to the 2013 lows. That tells you all you need to know about uneducated retail traders. Always trying to pick tops and bottoms of markets. I prefer to be alert, watch how price action plays out, wait for the market to play its hand and either trade in that direction or stand aside completely.